LUNENBURG, Massachusetts, March 3, 2011 (ENS) – Turtles and tortoises have survived on Earth for 220 million years, but their armored shells no longer protect them from extinction within the next few decades, finds a new report from the Turtle Conservation Coalition, which names the world’s 25 most endangered tortoises and freshwater turtles. About half of the 328 species of turtles and tortoises are threatened with extinction, warns this global alliance of conservation groups, which includes the IUCN Species Survival Commission’s Tortoise and Freshwater Turtle Specialist Group. “Turtles are in serious trouble. They are some of the world’s most endangered vertebrates, more than mammals, birds, or even highly endangered amphibians. Half of their species are threatened with extinction,” says Dr. Anders Rhodin, chair of the Specialist Group and one of the report’s co-editors. “They’re being unsustainably collected from the wild for food, perceived medicinal beliefs and pets, while their habitats are being polluted, degraded and destroyed every day,” Dr. Rhodin said. 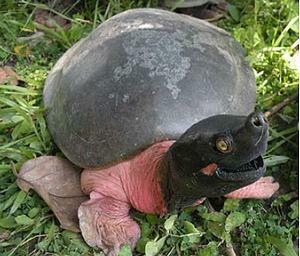 Of the world’s 263 species of freshwater and terrestrial turtles, one species is already classified as Extinct, with 73 either Critically Endangered or Endangered and 117 considered Threatened by the International Union for the Conservation of Nature, IUCN, which maintains the authoritative Red List of Threatened Species. Of the 58 species of tortoises, seven are already Extinct and one is Extinct in the Wild, with 33 of the remaining 50 species considered Threatened, and 18 either Critically Endangered or Endangered. This amounts to 41, or 71 percent, of all tortoise species either already gone or almost gone. Of the seven species of sea turtles, six are considered Threatened, and five are Critically Endangered or Endangered. 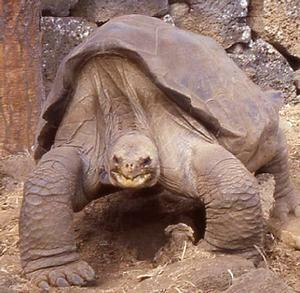 Lonesome George, the last remaining Pinta Giant Tortoise, Chelonoidis abingdoni, one of Darwin’s famed Galapagos tortoises, tops the 25 most endangered list. The species was driven to near-extinction by consumption by whalers in the 19th century and other Galapagos settlers in the 20th century. Lonesome George was found on Abingdon island in 1972. He was moved into protective custody at the Charles Darwin Research Station on Santa Cruz Island in the hope that a female might be found for a captive breeding program, but this has not happened. The second most endangered is the Red River Giant Softshell Turtle, Rafetus swinhoei, of China and Vietnam, weighing over 120 kilograms (250 pounds) with a shell over a meter (39 inches) long. With only three males and one female left in the world, the stakes have never been higher for this species. 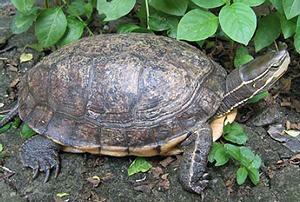 Seventeen of the 25 most endangered turtles are found in Asia. Every tortoise and turtle species in Asia is being harmed in some way by the international trade in turtles and turtle products, while laws and treaties are not enforced, the report finds. In China the turtle trade is enormous, with millions of turtles being imported annually from all over Asia, Africa and North America to meet the demand. The report finds that most of China’s native turtles are nearly extinct in the wild, and many of these species are included on the 25 most endangered list. A good example is turtle number nine on the list, Cuora trifasciata, one of the oldest known members of the genus, first described in 1825. This species was once distributed throughout the hill streams and marshes in forests of the southern Chinese provinces of Fujian, Hong Kong, Guangdong, Hainan, and Guangxi, but it has now vanished from most of its former habitat due to high demand for use in traditional Chinese medicine. The Chinese name for this species is Golden Coin turtle; the word turtle in Chinese has the same sound as the word for return, so people believe it will bring good luck because its name suggests gold coins will return. Recently, traders claiming that consuming jellies and extracts from Cuora trifasciata was capable of curing cancer, caused an enormous increase in the commercial value of this species, with animals now selling for thousands of dollars each. Because of its high value, the species now is being farmed by the thousands and there is a demand for breeding stock, but the last three decades of intense collecting and massive habitat destruction have brought the Golden Coin turtle to the brink of extinction in the wild. The international pet trade has had a devastating effect, with wealthy collectors willing to pay tens of thousands of dollars on the black market for endangered turtles and tortoises. Number three on the endangered list, for instance, a small dull brown turtle known as the Yunnan box turtle, Cuora yunnanensis, fetches prices of up to US$50,000 for a single animal, making it the most expensive of all the Chinese box turtles. Despite intensive field research, the species was not seen between 1940 and the early 21st century and its presumed habitat disappeared under the expanding urban area of Kunming, Yunnan province. This led to the assumption that the species was extinct, and it was officially listed as Extinct on the IUCN Red List in 2000. But in 2004, photos of a female specimen were posted on an internet forum with a request for identification. A few months later, an adult male appeared in the local pet trade. Both animals were purchased by a local turtle specialist and have been bred. Since 2006 they have produced a dozen hatchlings. Genetic research has confirmed that they are pure specimens, not of hybrid origin. 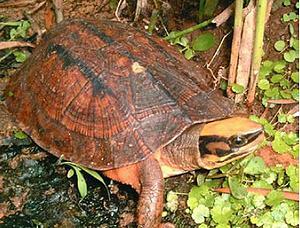 In addition, there is hope for restoration of the Yunnan box turtle in its native habitat. After nearly a decade of intensive searching, the habitat was found in 2008 by a team from Kunming Institute of Zoology. The Turtle Survival Alliance has taken up the fight to save turtles, focusing on conservation action such as captive breeding. The group is committed to zero turtle extinctions. “Turtles are disappearing fast and we are dealing with one of the most significant wildlife crises of our lifetime. This should be a wake-up call for all of us,” says Rick Hudson, president of the Turtle Survival Alliance and a co-editor of the report. Populations of the Northern River Terrapin, Batagur baska, once abundant in river deltas and estuaries of Orissa and West Bengal in India and the Ayeryawady Delta in Myanmar as recently as the early 20th century, have now all but vanished. The genus Batagur, comprising five Critically Endangered and one Endangered species, is the group of river turtles closest to the brink of extinction, according to the report. In November 2010 a wildcaught male was seen slaughtered at a market in Dhaka, Bangladesh, “providing evidence of a few remaining specimens in the wild,” the report states. 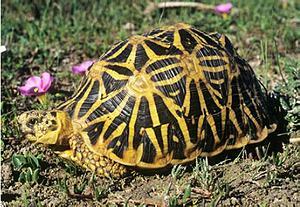 Number 22 on the list, the Geometric tortoise, Psammobates geometricus, of South Africa is still found in fragmented low-lying areas of the Western Cape Province. It prefers acidic, sandy and nutrient-poor shale and alluvium soils characterized by grasses and low to medium-high shrubs. Habitat destruction for vineyards and wheat farming, degradation by invasive non-native plants and animals, coupled with fire suppression and increasing predator pressure have been, and continue to be, the main threats to the remaining habitat patches and populations, the report finds. The Turtle Conservation Coalition is an informal alliance of the following organizations: IUCN SSC Tortoise and Freshwater Turtle Specialist Group, the Turtle Conservation Fund, the Turtle Survival Alliance, the Turtle Conservancy / Behler Chelonian Center, Chelonian Research Foundation, Conservation International, Wildlife Conservation Society, and San Diego Zoo Global.